A thick fog covered everything as far as the eyes could see. The rain from the day before had caused the temperature to drop sharply. Cutting through the mist a lithe agile figure sprinted through. Arnav Singh Raizada was out on his customary five mile run, a habit that he had developed during his years at Howard School of Business. For the past five years every morning he had woken up early and head out. He used the time to plan out his day or tackle some exceptionally tricky problem. He liked to stay fit too. Swift and alert, the body, the mind, and the man himself. Today his entire concentration was on the pain. He let his ma’s scream infiltrate each and every pore. His di’s smile clouded his vision. The shenai rang deafening his ears. Over time he had grown adept at pushing back the memories until they remained simply a constant reminder of the unfairness and cruelty of life. The bitter cold wind lashed across his face. He had broken into a sweat. Shyam Manohar Jha… had meant to cheat on di. The man she worshipped was a two timing.. 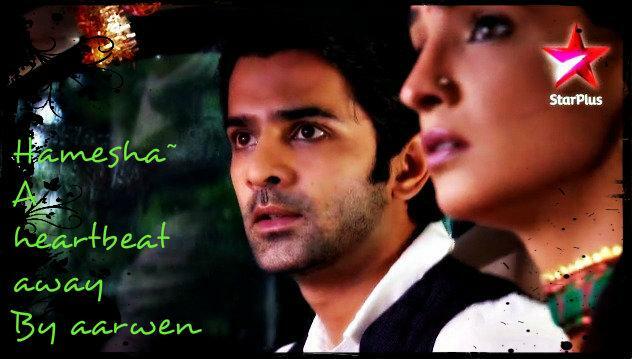 Lying.. ASR’s thoughts came all jumbled. Sharp stabs of memories.. The man he had grown to respect. his jeejajji.. Who fawned over his di.. Around whom his astute nani, his shrewd mami all fawned. Blind. ASR had been blind. Just like he had been blind at fourteen. He had to protect di, but what all exactly was he protecting her from? Would Shyam be foolish enough to have the audacity to pursue the thought of a future with khushi? The thought enraged ASR. He was furious. Only the steady rhtym of limbs controlled him from reaching that despicable man. He willed himself to think. Was this the only form of betrayal that Shyam had commited? ASR was not surprised at this thought. Long back he had learnt to rely on his instincts and something inside him was certain that Shyam was upto no good. Uncharacteristically out of breth ASR waslked in through the front door of Shantivan. Akash was used to thinking well of the world. Payal had insisted this was not some horrible misunderstanding, as if one could misunderstand something this bizzare! Akash had felt vaguely stupid even asking Payal if she was sure, but still asked. After all this was jeejaji. The man who had lived with them for the last three years. The thought that his jeejaji had been ready to cheat on di disturbed Akash immensely. And poor Khushiji dragged into this mess. Had bhai spoken to di? He had a lot of questions for ASR. Milder versions mostly of what ASR had already obsessively gone over in his head since last night. The irony was not lost upon Akash. As kids ASR, he and NK had played hours imagining themselves as detectives. Only this time there was no happy ending to the detective story. Their di was bound to have her heart broken whatever was revealed. Unlike what people generally thought of ASR Akash knew his bhai enough to not be surprised that Shyam was still in the house. There would be a logical reason he surmised. There was. As ASR recounted everything it took Akash a while to take in the lies jeejaji had fed di. How could someone lie so brazenly, he wondered. “Akash I cannot stand the thought of having Shyam anywhere near di. It is driving me insane lekin di..” ASR was sitting on the sofa in Akash’s room, his knees apart, head bent over, body held lose. “Bhai we can’t throw out the man if di won’t believe us. It will only makethings more difficult for di. Aap jante hai bhai“, Akash cautioned. “I know. However there are other things that I can do. That are already getting done“. ASR raised his head, a ruthless glint in his eyes. Akash was familiar with this expression. It didn’t come often, but it had been visible before on the cool rugged face of his cousin.The last time bhai had looked this way was when he had made the plan to buy Sheesh Mahal. Khushi Kumari Gupta flung away the covers, listening groggily to the racket outside. What was buaji shouting about? She idly considered getting up from bed. Then deciding it was too cold to get up right now she put back the bright fuchsia rajasthani blanket over her head and snuggled inside warm. She had barely slept last night. Arnavji had dropped her home himself, having refused to allow her to ride back on the scooter in the middle of the night. As if something would happen to her.. as if she could not take care of herself.. as if she needed him..
devi maiyya.. the only reason i let him drop me was because.. She stopped. Then pulled the blanket more securely over her head. In the makeshift darkness, sure that no one would be able to listen in on her thoughts she continued.. I wanted to spend some more time with him. I didn’t want the night to end. All night long she had tossed and turned drifting between flashes of a pair of the most captivating stormy eyes and a shirtless Arnavji who glistened in the moonlight. Even inside the blanket Khushi blushed a deep shade of red. hey devi maiyya.. what all was she thinking.. It was not like she hadn’t seen a man without a shirt before. Salmanji was famous for not wearing a shirt, but she hardly blushed thinking of that. This time she clenched her eyes shut willing the thoughts to go away. Buaji was still in conniption over something. As her words wafted to Khushi she sat up in bed. Looked like her family now knew that the Raizada brothers knew the truth that the Gupta family knew about Shyamji. It was as complicated a sentence to think of as to read and Khushi closed her eyes pressing her fingers to her forehead. Not enough sleep, distracting laad governors and complicated sentences were a terrible combination. She wandered out of her room lazily, stifling a yawn and surveyed her living room. Buaji was in full form having worked herself into a fit. Her favourite piece of red towel was tightly bound across her forehead and her long luscious plait swung boisterously as she spoke. Khushi went and sat down next to her amma. Garima gave her a fond smile as Payal spoke up. “buaji we had to tell Akash and Arnavji“. 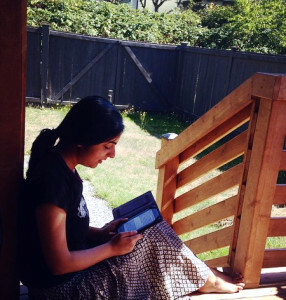 Before her sister-in-law could get in another never ending stream of words Garima spoke up. “jiji achcha hi hua these girls told them everything. Now we don’t need to worry“. Khushi squeezed her amma’s hand tightly then went to kneel near her babuji who seemed to be smiling. “babuji aap bhi yehi kehte na humein? To tell the truth and then face whatever be the consequences? I am very worried for di..” She paused undecidedly then added softly, “and Arnavji. Both trusted Shyamji“. She was startled to see a flash of pain shoot through babuji’s eyes. He was shaking his head in an uncontrolled way. What did he want to say? In a strong voice she tried to calm him, “babuji aap mat fikr kijiye. Arnavji will take care of everything. Humein bharosa hain“. Babuji slowly calmed down, but the overall air in the Gupta household was filled with a sudden sadness. The head of the family, with his wise words, had not spoken for many months now. The doctors had assured them that Shashi Gupta was getting better, but everyone still missed his kind intelligent and affectionate ways. Suddenly the silence was broken by a loud sniff. Buaji launched herself at Khushi. “sanka devi humka maaf kari diyo. Oo Shyam babua ko hum pehechane naahi. What would have happened if you didn’t find out on time“. Khushi extricated herself out of buaji large heavy embrace. “hum aapko ek shart par maaf karenge buaji. You have to make me pooris for breakfast, lunch and dinner today“. Khushi rolled her eyes in despair.. devi maiya why did such things have to happen to her?.. Buaji had already started her interrogation. How in the world was khushi going to get out of this? A pair of eyes followed the antics of the excited girl from far. They took in her pleading, laughing, happy dancing. Shyam Manohar Jha in his unassuming brown and white checked plaid shirt had merged with the passing crowd. The only difference from the milleu in Lakshminagar was in his expressions. He was hypnotized by the girl, but his mouth was pulled back into a viscous snarl and a hard to miss depravity was visible in his eyes. Khushiji had slapped him. And Arnav had dared lay his hands on Shyam’s collar. With satisfaction Shyam recollected how he had got the last laugh. His simpering fool of a blind wife had believed his story over her chote’s allegations. Luckily for Shyam he had been right here and had overheard Khushi and Payal talking about revealing his secret to the Raizada’s that morning. Of course he planned to kill off rani sahiba, it was just taking a little longer than anticipated. So, he had planned for a back up. An invaluable highly rewarding inspiring idea really! ASR would not touch him as long as Anjali believed Shyam’s story. And by the time she doubted him she would very well be taking her very last breath. The shantivan household had just finished with lunch. In her peacock blue net saree with her favourite set of bangles Anjali looked elegant and fresh from far. However, up close the dark circles under her eyes told a different tale. She was trying to concentrate on cutting the nimki in perfect diamond shapes for Om Prakashji to fry later. Her mind kept insisting on remembering her chote’s angry accusations. She knew he was mistaken, but what she couldn’t quite figure out was how could be make such a mistake. She did not doubt even the slightest how sincere he was in wanting to ensure what was best for her. And yet what he said could not be true. Frustrated she put down the knife and was about to get up when Shyamji walked upto her. He looked annoyed. “Rani sahiba I had cut a cheque from our joint account for some case related stuff and the bank says it got declined“, he was scowling. Shyam only looked more ill tempered hearing this. Without replying he was walking away when she called out. “Humein kaam rehta hai ranisahiba aap nai samjhengi“. Though his words were civil enough something in his tone hurt Anjali. Why did he always assume she would not understand about work? It is not like she knew nothing about working hard. When chote had been setting up AR industries she had seen him work day and night. However busy chote would be, if she asked, he had always tried to explain to Anjali what were the problem AR industries was facing. She missed feeling part of all this. When had her life become entirely about Shantivan food menus, never ending trips to the mandir and waiting for the her husband to return home? Khushi looked at the bangles in her hand and happily shook her hand enjoying the sound they made. Then with a mischievous grin she put her hands on Payal’s shoulder and swung her around to face the mirror in their room. “Look at your gold bangles jiji. Hello hi bye bye khoon bhari taang ke gold bhare haath“. She had managed an uncanny imitation of mamiji complete with the accent and mamiji own form of strutting around. Payal was also giggling helplessly. “chup kar Khushi“, she half heartedly admonished her sister. Khushi was already lost in the feel of the dupatta in her hand. It had intricate gold detailing all over the shaded pink and orange dupatta. The edges had embroidery. Similar embroidered motifs were scattered all over the dupatta. She put it over her head. A bride. Khushi Kumari Gupta..
How did one see through such a heavy fabric. She pulled the dupatta over her head as a ghunghat. Her vision was definitely obscured, but every sensation felt heightened. dhak dhak dhak.. She was a bride in a ghunghat. “jeeji isse dekh kaise sakte hai?“, she asked anxiously. Getting no answer she turned in a hurry, bumped into the edge of the bed, tripping forward. As she fell she felt a pair of strong warm arms encase her, as both she and the owner of those arms went sprawling onto the bed. She lay dazed, dupatta still on her head. He then moved slightly below her. A giveaway heat coursed all over as she realized what had happened. She had fallen on Arnavji! “Khushi?”, he gave a low moan. She shifted nervously then stilled as he lifted the dupatta covering her face. Arnavji’s face was inches from her, his arm comfortably around her waist. “hum.. kuch bhi toh nai..“, she decided there was no way she was going to tell him she was trying to figure out how one saw through a ghunghat. “You can sell your amma’s bangles for me and not tell me this?“, his voice was reproachful, but there was infinite warmth in those eyes. He had heard jiji talk about the bangles..
“You heard?“.. How long had he been listening to their conversation for? Her breath had hitched. “Apko kyu farak parta hai Arnavji?” . There was a quiver in the yearning in her question. He didn’t move, nor did he let her get up from the bed. She blushed at their scandalous position. Hmpph.. Laad governor.. Always trying to come out better in a deal..
“hum.. hum aapko nai bata sakte hai Arnavji. Let me go“, she wriggled. His hold around her waist only got stronger. Those bangles meant the world to her, but his happiness. It was vital. That was so long ago. When there was Lavanyaji..
A surprising flash of possessiveness exploded within her. He is mine.. And I am his.. Without conscious thought she snuggled closer to him. She could not quite recall if they were talking about the bangales, or her ghunghat or about farak parna and why. She was hopelessly distracted by the intimacy of their fall. “darling did I not tell you this yesterday? Tum mujhe kuch bhi bata sakti ho. Tumhara hone wala pati jo hun..“, if possibly she felt herself go redder..dhak dhak dhak.. Her heartbeat was so loud, even then she had clearly heard his words. And when had he started calling her.. She swallowed hard.. darling.. Hey devi maiyya.. She felt light headed and in near panic. “Arnavji koi.. Koi aa jayega“, she exclaimed. “aane do“, was his reply. Khushi felt herself shiver at his words. “par di..”, she tried again, a little less persuasive this time. “Payal is with Akash outside. Aunty, uncle, buaji with nani and mami are also outside“, he answered calmly, his voice shaking with suppressed amusement at her panicked state. “The faster you tell me, the faster I might think of letting you go, you know?“, his eyes glittered with mischief and other things that Khushi could not really name. “If you are shy to say it out loud, want to whisper in my ears“? A smirk followed. She gave up struggling. “I was trying to see ki ghunghat pehen ke dikhta kaise hai? Ab choriye humein“, she disentangled herself from him and pushed herself up. He sat up too, much more slowly. Both sat close to each other, at the every edge of the bed. “besharm.. Laad governor..“, she mumbled darkly, but made no further move of walking away. Her legs felt unsteady and the acidity attack was much stronger than usual. Standing up would not be such a good idea right now. “umm Khushi bhabhi.. Chote.. humne kuch nai dekhe.. “. They looked around to see Anajli hovering near the door, her hand covering her eyes. She withdrew hastily closing the door behind her. Khushi wanted to jump inside the blanket and cover herself, maybe splash some ice water on her inflamed cheeks. That.. that laad governor was still smiling.. What would di think? Sitting on the bed.. So close.. In her room.. Alone..
She glared at him and got up from the bed, only to be smoothly pulled back by him. She landed onto his chest and they went sprawling on the bed again. “Well ab jab di ne humein dekh hi liya hai then might as well make a little good use of this time“, he chuckled. “So where were we?” With a self assured air he leant forward and captured her lips in his, confident that she wanted the kiss as much as him. She did want the kiss as much as him.